Information on the piano lamp clamp. Cast aluminum alloy grand piano clamp has an additional variable 360 degree swivel adjustment via a separate thumb screw that can be secured to any surface on a Grand Piano. 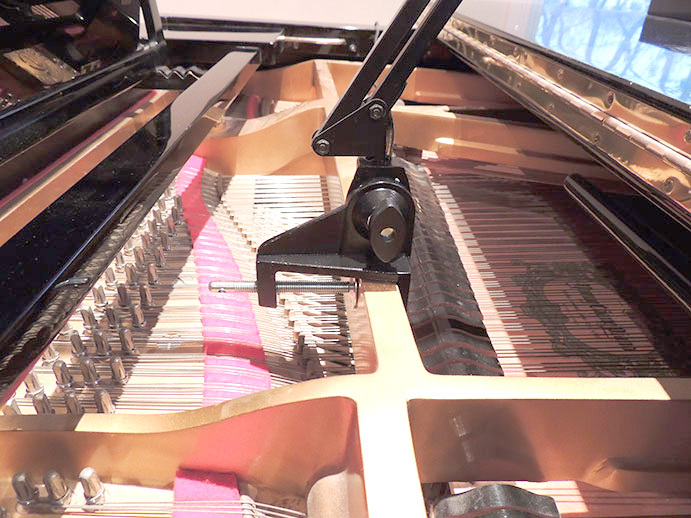 It will fit all Grand Pianos with a similar type of cast iron frame as (shown on a 7′ Young Chang Grand Piano). It will also fit on Kawai, Yamaha, Steinway all Grand Pianos. Cast aluminum alloy grand piano clamp can be adjust to the cast frame on your Grand Piano. Black felt or non marring rubber is included to protect cast iron frame of any Grand Piano. Please call or email if you have questions.